The phrase "engineered wood" includes many man-made constructs. The most common of these are plywood, particle board and MDF. 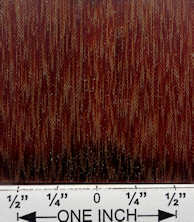 Less common are constructs such as oyster veneer and the "engineered wood" shown on this page that looks like bocote/cocobolo. There are also species of wood, or at least types of wood, that are treated with various combinations of heat and chemicals. The most well-known of these in the USA is "pressure treated" wood which is used outdoors for decking, fences, etc There are other forms of "heat treated" wood. The fully engineered products (as opposed to those that are treatments of planks and beams), some of which are also called composite wood, or manufactured board are made by binding or fixing various forms of wood (strands, particles, fibers, branches, veneers, etc) together with various types of binding agents and usually using heat and pressure. Oyster veneer is a special case, done manually by parquetry. The results can be highly useful products such as plywood, which allows for the relatively inexpensive construction of sub-flooring and roofing, for example, or highly decorative products such as oyster veneer. "Useful" forms of engineered wood products are of little interest to me for this site since it is about identifying types of wood, not things that can be made from wood. 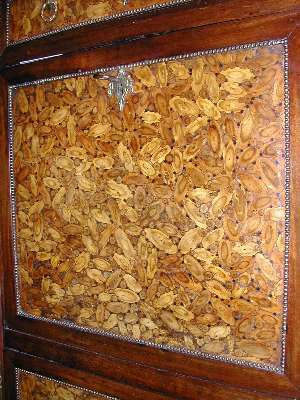 The decorative types however are occasionally confused with plain wood itself and this page is mostly intended to show the differences. I wasn't planning on putting anything about plywood on this page since there is a plethora of information about it elsewhere, but I just had to show this piece. I'm not positive about the provenance on this but my belief is that it is 40 to 50 years old.possibly more, and I just don't see anything like it in the stores these days. This is 5/8" plywood with all 5 plies being good grade (especially the outer plies) Douglas-fir. I didn't get the face grain 'cuase it was old and very dirty/grotty and I didn't want to bother cleaning it up. this pic was sent to me for identification and at first I thought it might be some weird form of cocobolo because of the color even though the grain looks much more like bocote (if anything). The mystery was solved when he sent along the end grain pics below which show clearly that it is an engineered wood, made by laying thin strips of varying widths and of different woods together lengthwise (probably while wet, so they bend and merge easily) and binding them (almost certainly under high pressure) into groups big enough to be cut into planks. This is some neat looking stuff. 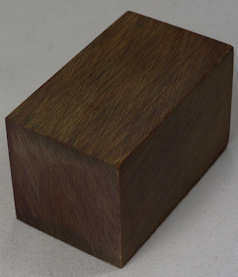 Oyster veneer is not really a veneer in the normal sense of slicing wood to produce thin sheets but rather the sense of putting a thin layer of something over a substrate, in this case using a technique known as parquetry. Thin slices of various sized wood branches are cut in cross section, sometimes perpendicular to the growth to produce round cookies and sometimes cut at an angle to produce oval cookies. 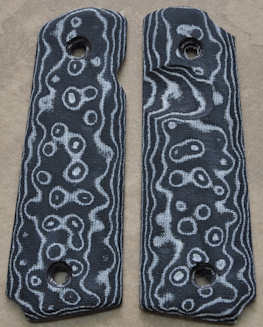 These cookies are then overlaid side by side and glued down on furniture surfaces to produce various decorative patterns. 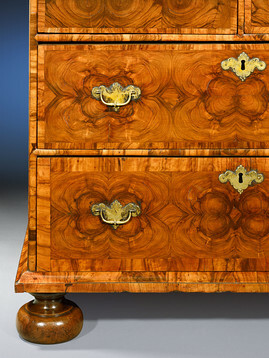 The name "oyster veneering" was because the resulting shapes sometimes resemble an oyster shell. 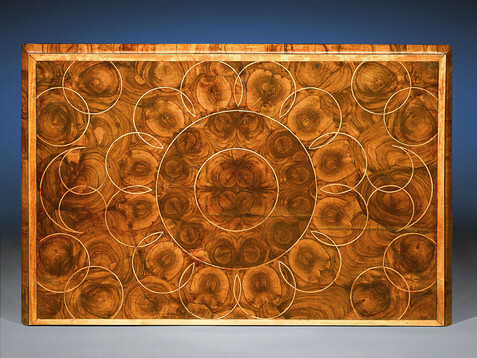 Careful matching was often done in the parquetry process, in order to produce what it real veneer would be called quarter matching, thus giving an even more elaborate and fancy looking design. oyster veneer on a chest of drawers and a closeup of one corner. drop-down drawer front and a closeup, showing the angled branch slicing that results in oval-shaped cookies. It is my ASSUMPTION that this is the front of a drop-down drawer front because of the placement of the key at the top. Both levels of enlargement are present, showing the branch layering in great detail. I note that there are multitudinous equal-sized burned-looking blackish holes throughout. I have no idea what these are. Possibly they are not holes at all but the branches of a very dark colored wood but if you look at the 2nd enlargement of the detail pic, I think you'll agree w/ me that these are holes. 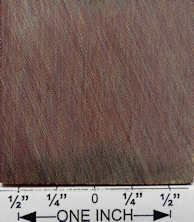 This is an example of oyster veneer that is angle-sliced to produce oval cookies. 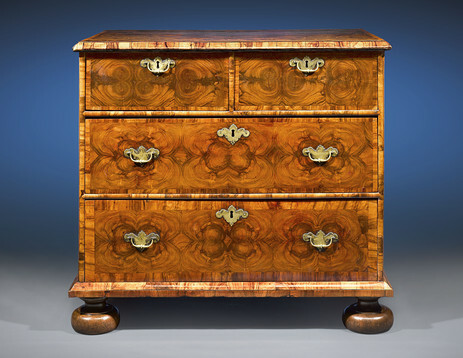 unidentified furniture with white circular inlays that I'm sure were done as an added decorative touch after the "oyster veneering" parquetry was done. 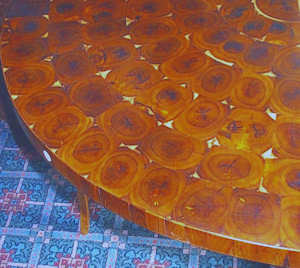 portion of a circular table-top, showing the parquetry cookies cut perpendicular to the branches and filled in, apparently, with something white. Close inspection of the enlargement shows that the cookies were flattened on 4 sides before being placed, and they were laid down in a circular rows. Copied directly from Wikidpedia: Micarta is a brand name for composites of linen, canvas, paper, fiberglass, carbon fiber or other fabric in a thermosetting plastic. It was originally used in electrical and decorative applications. 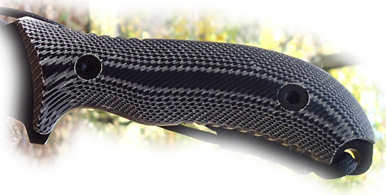 Micarta was developed by George Westinghouse at least as early as 1910 using phenolic resins invented by Leo Baekeland. These resins were used to impregnate paper and cotton fabric which were cured under pressure and high temperature to produce laminates. In later years this manufacturing method included the use of fiberglass fabric and other resin types were also used. Today Micarta high pressure industrial laminates are produced with a wide variety of resins and fibers. 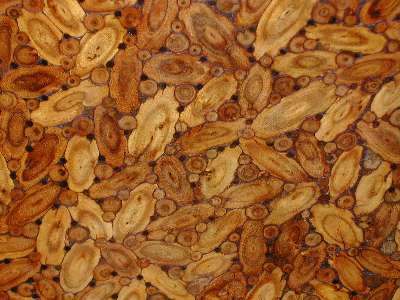 The term has been used generically for most resin impregnated fibre compounds. Common uses of modern high pressure laminates are as electrical insulators, printed circuit board substrates, and knife handles. this little piece of "wood" was dropped off with me to see if I could ID it and I put it aside and somehow didn't get back to it until a couple of years had gone by and I had forgotten who even gave it to me. As soon as I looked at the end grain closeup, I realized that it was not wood and the end grain update made that even more apparent. I asked on the Wood Barter forum and folks there suggested that it was some kind of micarta, which I had never heard of. I check it out and found the above statement and lots of examples of knife makers and gun-handle makers who make their own versions of it. end grain and END GRAIN UPDATE of the piece directly above. HUGE enlargements are present and make it very easy to see the extreme regularity that made it immediately obvious to me that this could not possibly be any natural wood but had to be some kind of man-made product. 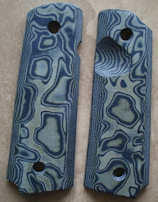 Knife-handle and gun grip makers find this an appealing construction technique becasuse with the right material you can get some striking results. The samples below are mostly fiber-based but you can find plenty of examples on the internet that use a more slick phenolic-like material such as my own sample above. knife handle and gun grips with HUGE enlargements that clearly show the fiber nature of the material used for these particular examples.